If you haven’t finished your holiday shopping (or even if you have-there’s always room for books, right?) here’s three delightful picture books for the younger set that were just published in 2017. Spring Hare by Eugene Yelchin. Henry Holt and Company, New York, NY, 2017. This book reminded me of another wordless picture book from my days of student teaching. Of course I can’t remember the name of that book—only the pictures. I believe there were bears involved. 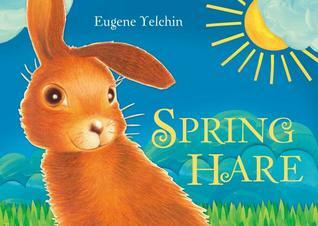 Spring Hare begins with a little girl about to jump onto a trampoline as a small rabbit watches. She in turn gives him a look that seems to say, “Come along.” And come along he does. He follows her up, up, up into the air as she rides in an airplane, a hot air balloon and a rocket ship. All the while, the girl keeps an eye on the little rabbit following her. He has some trouble along the way, but young children will have no trouble at all making up their own story to go along with the pictures. Yelchin’s whimsical illustrations are sure to delight the youngest child as well as the adult sharing this book. I Promise by David McPh ail. Little Brown & Company, New York, NY 2017. Mama Bear and her baby are splashing in a waterfall when Baby Bear asks Mama to sing to him. 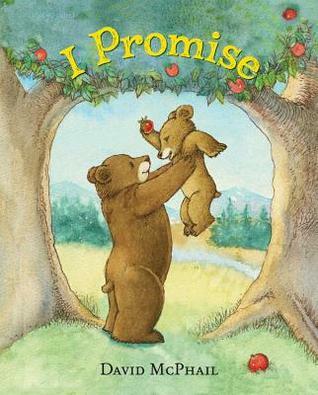 She replies, “Later, dear…I promise.” When they decide to dry off, Baby Bear asks her what a promise is. Mama explains to Baby that a promise is “…when you say you will do something, and then do your very best to do it.” She further explains that a broken promise is not easily fixed. McPhail’s watercolor illustrations, done in the soft tones of nature, have a soothing quality which makes this the perfect bedtime story. And it will reassure all Baby Bears everywhere that Mother Bears keep their promises to not just sing to them, but to love them, “…always and forever.” As Mother Bears everywhere know. 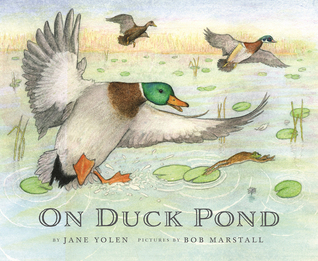 On Duck Pond by Jane Yolen, pictures by Bob Marstall. The Cornell Lab Publishing Group, 2017. Marstall’s illustrations are big and bold. For example, a frog leaping off a lily pad takes up almost a whole page, and clearly shows the terror the frog is feeling on being so suddenly disturbed. This book is published by the Cornell Lab of Ornithology, but don’t let that cause you to file it away for older children. The cadence of the poetry makes for a faster read with the youngest child, while older children will be enthralled with the detailed illustrations. The last three pages identify the birds and other animals in the story, as well as activities and resources to pursue. This book can and should be used in K-5 classrooms, as it surely would appeal to a wide range of ages. And like the book Journey which I recently reviewed in this space, On Duck Pond can be used in many subject areas, from poetry and writing to science and math.